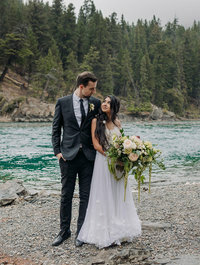 I don’t tend to use words like “blessed” but in this instance I think it’s accurate that I was blessed to be able to spend the day with Katie, Jay and their immediate family for their amazing intimate Chateau Lake Louise wedding. I get to meet a lot of people and a lot of the time Our first face-to-face is on the wedding day, and within seconds, I felt like I had known Katie forever. She was absolutely amazing and so were all of her and Jay’s family! After getting ready with the ladies, I met up with Jay on the Terrace for a few photos of him. The Terrace is a beautiful spot for a ceremony, but it’s a little frustrating when a gazillion tourists stop in the background to watch,essentially ruining the background. It takes a quick trigger finger to time it to get a few shots without people gawking and ruining the background. Following the ceremony, there was a champagne toast and we headed into family photos. We did portraits showing the glorious view of Lake Louise and afterwards I whisked Katie & Jay off to Moraine Lake (we were lucky we got down the road!) where they had the luck of getting one of the chipmunks to visit them for photos! We wrapped the night back at Chateau lake Louise and I was sad when it was time for me to leave. I loved spending the day with Katie, Jay & their awesome families for their intimate Chateau Lake Louise wedding. 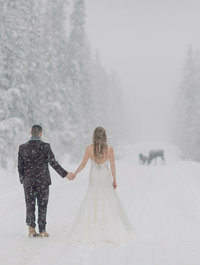 Are you planning an Intimate Chateau Lake Louise wedding? 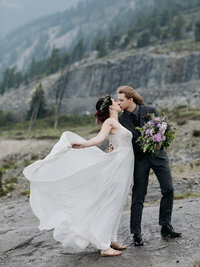 I’d love to be your wedding photographer! Use the contact form to get in touch and get pricing details. 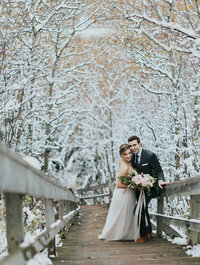 I simply adore photographing weddings and elopements at Lake Louise! I also photograph weddings in Banff, Calgary, Canmore, Emerald Lake, Fernie, Golden, Jasper, Kamloops, Kananaskis, Kelowna & Nordegg. I also love to travel to photograph weddings, I’ll happily travel to you!